In the course of the project Cultour+ Time Heritage undertook a number of dissemination activities. We have inaugurated and regularly update the Facebook page Thermal Tourism in Europe (https://www.facebook.com/Cultourplus.info.en/notifications/) The page helps contact between communities and individuals interested in Thermal Tourism either as social agents or as entrepreneurs or even as tourists and users of thermalistic facilities. Through the support and confidence shown in our project by the Secretary General of the Association of Municipalities with Thermal Springs in Greece, mr. Marcos Danas, Time Heritage was invited to participate at a number of events and conferences. 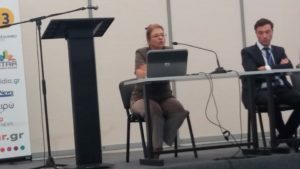 “Cultural Itineraries of Thermalism in the course of Cultour+ project” was the title of the presentation by Head of Time Heritage Afroditi Kamara at the NOSTOS Expo Forum in Naupaktos on October 15th, 2017. The venue was a large fair on Tourism organized by the municipality of Naupaktos between October 13-16. The presentation was hosted by the Association of Municipalities with Thermal Springs, the Secretary General of which, mr. Marcos Danas, preceded it with a lecture on the state-of-the art of Thermalism in Greece. Among the audience were many mayors and members of local administration who became vividly interested in the opportunities of networking, best practices’ exchange and education offered by Cultour+. Time Heritage was invited again by Mr. Danas to attend the MITE (Mediterranean International Tourism Exhibition) at the MEC Expo Centre in Paeania, Athens, on the 20th of October 2017 with a presentation similar in content to that in Naupaktos. Unfortunately the entire session on thermal tourism was cancelled at the last moment due to organizational problems. On the 24th of November Time Heritage members Afroditi Kamara and Maria Tsitimaki attended the French-Hellenic Forum on Tourism as a lever of development organized by the Franco-Hellenic Chamber of Commerce and Industry. 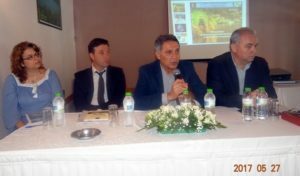 A session was dedicated to the importance and growing numbers of thermal tourism worldwide. The Forum was a chance for us for further contacts with representatives of organizations and companies from France and other countries.